For decades, a walkway made it possible for a pedestrian to cross the Hudson with relative ease. 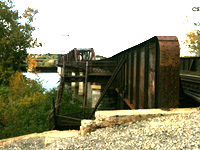 The walkway eventually closed because of it’s deteriorated condition but this has not stopped a few daring souls from crossing the bridge via the tracks – something that is dangerous and illegal. The entire bridge has long been in dire need of an overhaul. Repeatedly the weight limit for the bridge has been lowered and one of the bridge’s two tracks has been closed indefinitely, exasperating an already stressful bottleneck delaying trains and reducing the freight capacity of the bridge. The idea of rehabilitating the walkway is nothing new. It’s been in the Capital Region’s Transportation Improvement Plan for nearly a decade, and the walkway is part of the long range vision(and draft “longer” vision) from the Capital District Transportation Committee. It’s also part of a number of local and regional studies. There is a safe and accessible way to accommodate both trains and pedestrians on the Livingston Avenue bridge, and there are other communities, and rail companies in the US that are coming to agreeable terms for separated bike/pedestrian access on rail bridges. 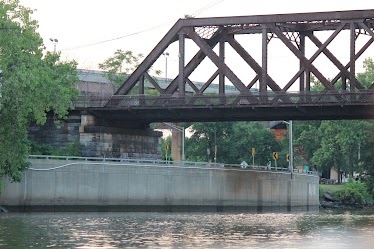 Amtrak and CSX have executed a lease that gives Amtrak sole responsibility for operations, capital improvements, and maintenance of the Poughkeepsie corridor, but the news coverage was mum on the impact of the lease on the Livingston Avenue Bridge. Ultimately, because financing for this project is coming in part from High Speed Rail funding, the gatekeeper for this project will be the Federal Railroad Administration (FRA). Thus, our coalition of supporters and stakeholders will need to send a clear, strong message to our local and state leaders, and our Congressional Representatives, that the FRA should not use it’s authority to undermine the bike and pedestrian access on this important link. A comprehensive list of studies about the economic, health and social benefits can be found here. The website has also posted a wealth of data on the relationship between multi-use trails and property values, crime, vandalism, trespassing, and privacy. Parks & Trails New York also has an extensive collection of studies and reports to support trail development, validating the benefits, and dispelling urban legends about the value, and effect, of trail development. Regional Trail Perspectives, A survey of Capital District Trail Facilities examined characteristics and user and adjacent landowner perspectives of three capital district trails. Read more about the growing number of rail WITH trail facilities and the safety record of these trails in this Rails-to-Trails Conservancy report.